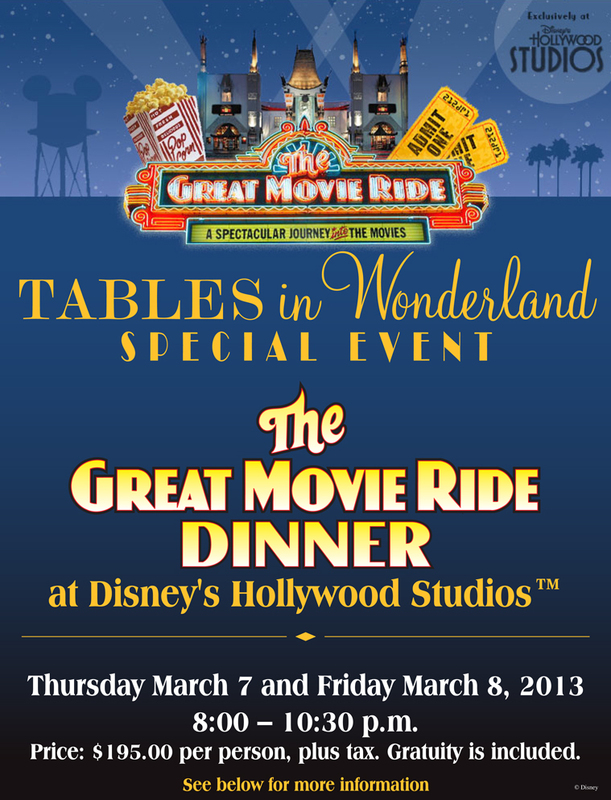 Here's another exclusive event for Tables in Wonderland members! Price: $195.00 per person, plus tax. Gratuity is included. Arrive at Disney’s Hollywood Studios® and walk through the courtyard of the Majestic Graumann's Chinese Theatre. Then you will be invited to come inside The Great Movie Ride after the attraction is closed with exclusive backstage VIP access! We've cleared the track for you to walk through and dine inside the attraction where you will experience some of the most classic scenes in motion picture history. Sets from Busby Berkeley musicals, crime dramas, old-fashioned Westerns, and more! 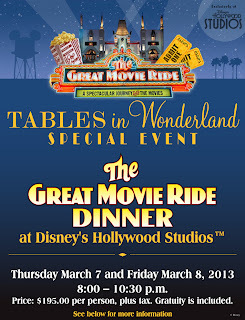 For reservations, please visit the following website www.disneyurl.com/TIWTheGreatMovieRide for self-booking and instant confirmation. The website will go live and begin taking reservations on Tuesday February 19, 2013 at 10:00am.